Make any tea into “Masala” tea by adding this magical blend of eight spices known for culinary flavors and therapeutic qualities. 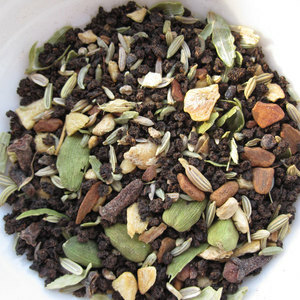 When brewed with black tea and milk, this spice blend makes a bold, fragrant and smooth cup of Masala Chai that will transport you to India in just one sip. The magical mix of eight spices is perfectly balanced so that no single spice dominates the palate. The boldness of cloves and nutmeg with the spice of ginger are balanced with the fragrance of cardamom and the sweetness of cinnamon. Fennel and white and black pepper add further layers of complexity. This blend can also be used with green tea or rooibos as well as in soups, stews and countless recipes that need to be spiced up! This blend of spices is so versatile that it could be used in just about anything. I considered grinding it fine and using it as a rub on a pork loin, but then, remembering that I still had a teeny-tiny bit of my Sweet Caramel O’Mine tea, I decided that I would use my sample of this spice blend as an enhancement for a cup o’ Spiced Sweet Caramel O’Mine. I used three teaspoons of the spices with three teaspoons of the tea blend. This made a very pleasant 3 cups of bold and spicy tea. I added a dollop of honey and found that it was just perfect served this way. To make a latte, I would have reduced the amount of water that I used to brew (only 2 cups of water) so that the milk wouldn’t dilute the flavors. And … OH MY GOODNESS. This is good. Somehow the spices bring out the burnt sugar aspect of the caramel, giving this an almost sweet-and-savory kind of taste. I think the nutmeg and the caramel compliment each other so well! The main spice flavor that I’m tasting is the ginger, which when combined with the white and black peppers give this cup a very peppery kick! The cinnamon comes just after the ginger, and the cardamom and cloves add pleasant dimension. I can’t taste much of the fennel here, and while I do like fennel, perhaps it is a good thing that I can’t taste it too strongly with this tea. I think it might taste a little too funky with the caramel. I really like this blend. I think I may be buying a tin of this in the near future so that I can use it on my next pork loin roast. If I do this, I’ll be sure to post a review and the recipe on my Foodie Blog! Mmm! This is GOOD! The spice is strong and zesty! The pepper and ginger are the most prominent of the spices, but, they do not overpower the balance of spicy tastes. The green tea base is a bit lighter in flavor than you’d experience with a black tea chai, but then, that’s to be expected. It has a fresh, lightly vegetative taste to it, and I think that the tea is nicely complimented in this blend of vibrant spices. I have tried this chai a couple of times now. The first time, I tasted it without milk and I liked it a lot that way. The spices were very lively. The second time, I decided to go latte, and it is also very good as a latte. The spices are muted a little by the milk, but the peppery kick can still be tasted. The green tea’s vegetative qualities are enhanced a little by the addition of milk, which I found interesting. Both ways are tasty, but I do think I prefer it non-latte, just because more of the spices are highlighted that way. 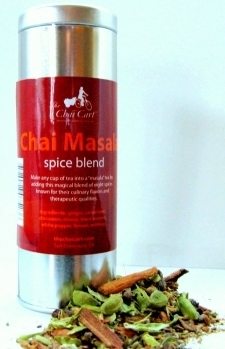 Which ever way you choose to serve it, this is a chai I would highly recommend to those who enjoy spicy chai teas! It’s yummy and makes me happy! And the fact that it’s 100% Organic and Fair Trade – well that’s something to really smile about! » When can I drink it/What is it for? » What does the tea taste like? – Eaters digest is a mild, soothing tea with chamomile and fennel as the prominent flavors. » How do the ingredients work in my system? – The tea is a safe and thoughtful blend of carminative (herbs that expel stomach gas and relieve bloating) and digestive herbs. • Anise is very widely used as a stomachic and for relief of flatulence and colic. 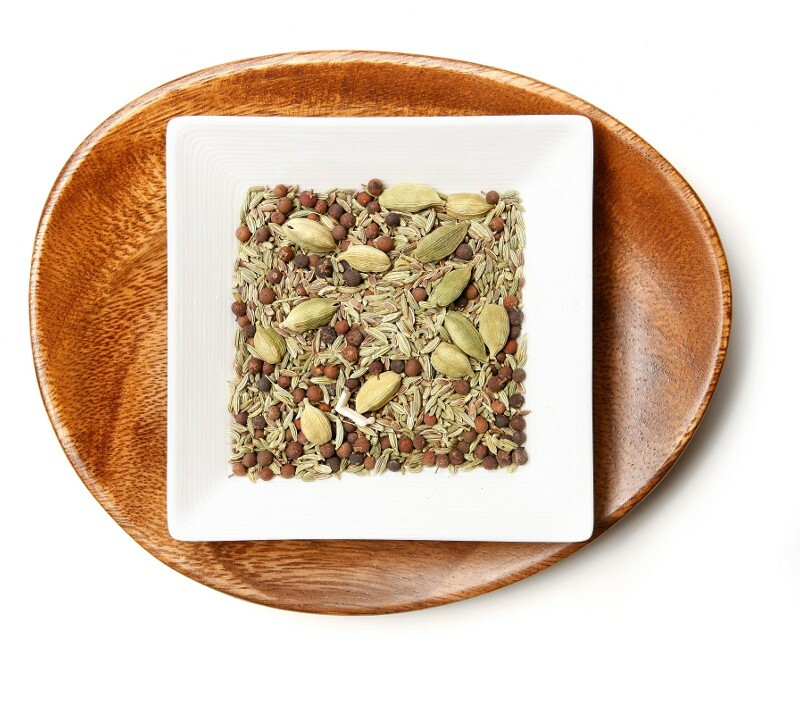 • Carom Seeds aid in digestion. • Cardamom is a tonic for the digestive system. • Chamomile is known to soothe digestion and relax the gastro intestinal tract. • Dill Seeds work well for the treatment of gas and nausea, especially from sudden changes in diet. • False Pepper is a stomachic and is used for flatulence, indigestion and bloating. 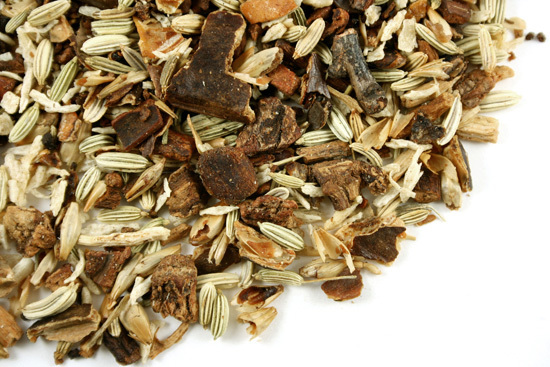 • Fennel aids digestion, fights abdominal cramps and improves bad breath. When I first received this tea, I was a little worried that it would end up tasting very medicinal. But it is actually quite tasty! Yes, it does taste herb-y with a gently spiced flavor, it doesn’t come across as really medicinal to me. It has a pleasant flavor. The chamomile is a delicate, and the star anise (and to a lesser extent, the fennel) offers it an agreeable licorice-y kind of taste that lingers in the aftertaste. I’m enjoying this. This is an herbal tea that keeps its promise! I am not going to say that it’s my favorite tisane, because it isn’t. But, what I will say is that I would much rather drink this tisane than take some over-the-counter remedy to relieve my discomfort after eating a meal that maybe I shouldn’t have indulged in (we all do that, don’t we?) It does what it is supposed to do, and that makes it alright in my book! – Assam Tea (black Tea): Black tea is a variety of tea that is more oxidized than the green, oolong and white varieties. All four varieties are made from leaves of Camellia sinensis. Black tea is generally stronger in flavor and contains more caffeine than the less oxidized teas. NOTE:The USDA recently stated that drinking black tea may lower bad cholesterol levels and could one day be used to help reduce the risk of heart disease. Read more. Click here! – Cloves: An energizing herb,* cloves are an effective stimulant and aromatic for the lungs and stomach. * Cloves are used extensively in Ayurvedic herbology. This is wonderful! It leads me to believe that much of the fennel that I have had in teas has been either artificial or enhanced in some way with additional flavoring and/or the blends I have had have been too over the top with the other ingredients that either don’t mesh well with the other spices or interrupt the natural fennel taste! This is what fennel SHOULD be all about! This has a great deal of Fennel IN the mix but it tastes very good and more natural tasting than others I have tried prior to this little gem from Yogic Chai! The other ingredients are gentle and in the background. They only assist and do the fennel justice in this specific case! 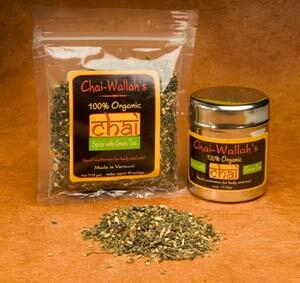 I’m very impressed with Fennel Masala Chai fro m Yogic Chai! This if my favorite Fennel Related Tea to date! Being in tune with nature (Prakriti) also means being in tune with your own nature. In Ayurveda, working toward a harmonious balance with nature and your body constitutions – Vata, Pitta and Kapha – helps bring Ujaala into one’s life. Ujaala is a stimulating blend of black tea and spices. It will rejuvenate and renew your stamina and energy. Flavor Profile: Slightly Peppery with an underlying sweetness. Ingredients: 100% Organic High Elevation South Indian Black Tea Leaves, 100% Organic Coriander, 100% Organic Cloves, 100% Organic Marigold (Calendula) Flower Petals. The dry mix aroma reminds me of a pale chai. Post infusion – it smells like a sugary black tea with hints of spice…maybe more cinnamon than the other spice types. The taste is wonderfully surprising. If you are looking for heavy spices – this is on the light side but I’m totally LOVING it! There is something naturally-sugary, too, that I can’t put my finger on but it’s delicious! It’s slightly chewy but not the chewy one may expect. This is VERY different and I really like it VERY MUCH! Peach Apple Crisp was the very first tea I tried from The Persimmon Tree Tea Company and I must say I am impressed! DRY this smells like various black teas, peaches, apples, flowers, spices, and a little hibiscusy. It’s FULL of aroma and I like that!Post infusion… this smells mostly of peaches, apples, flowers, and cinnamon. Different than the pre-infusion but still very nice and very aromatic! Another PLUS in my book! It infuses to a nice medium golden brown color. The flavor is absolutely delightful! I can taste individually the peach, the apple, the cinnamon, and the flowers…but they all jive well together! The stereotypical Rooibos taste wasn’t really there as much so I would suggest this blend to ANYONE who thinks Rooibos is NOT for them…this just may change your mind! The more I sip on this the more I like it! My first cup I had HOT but assume it would be tremendous cold, too! I am going to have to put that to the test very soon! Simply put…I LOVE THIS blend! I have officially put it in my upper 95+ percentile of teas I LOVE. Stay tuned to SororiTEA Sisters for more tea reviews from The Persimmon Tree Tea Company!